On the 7th, he was suppose to take the 12pm flight back to Korea when he was suddenly down with a high fever in the morning. He was sent to the hospital and was diagnosed with influenza (H1N1). 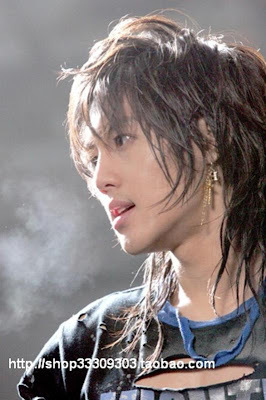 Kim Hyun Joong is now is having treatment in one of the hospitals in Japan. The local doctor has given him tamiflu and his condition has turned better. From now onwards, he will need to take a good rest in order to recover. DSP Media related parties and manager are with him checking on this condition. Once his conditions become better, they have the intentions to bring him back to Korea. So he was already sick with it at the events, no wonder he looked more quiet than usual in Malaysia and Japan...except when performing songs with SS501. It's possible Young Saeng is also being quarantined in Japan. We didn't see Young Saeng and Leader coming back to Korea, right ? At least I didn't see it in every site I went to...I didn't blog about it though...I only saw Jung Min, Kyu Jong and Hyung Joon in Liezle's blog. Kim Hyun Joong FIGHTING....we know you can do it. I'm imagining Hyun Joong like he is below...full of spirit !! SS501 and Leader FIGHTING !! A representative from DSP Media gave a formal statement saying, "Scheduled for a flight, at 12pm on the 7th of September, he had passed through immigration without any problems but later in the afternoon, due to a sudden change to his health, he was taken to the emergency room." Someone send him and his bandmates some Vitamin D NOW! He he Tamar....yep I agree ! They ought to try that...since it is so beneficial.The Tamiflu ..hmm ....it's still controversial. Don't know about Asian/tropical countries though...isn't the vit D level in people here suppose to be higher? Since we don't have winter, like here and Malaysia. The virus could have adapted or mutate [much like " The Borg " ].